Sat minding my own business last evening and heard engine noise outside. 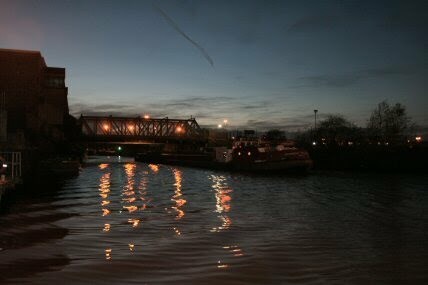 Another boat going past in the dark thought I. 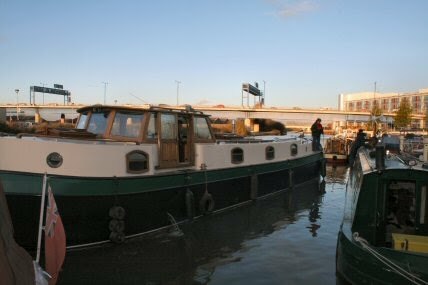 Looked outside and it was but rather larger than the usual narrowboat. It was the Humber Princess rather low in the water and heading for the lock under the railway bridge. Went out today for a wander around Doncaster. While it was market day and there are a number of interesting shops the place isn't much different to all the others. There is still the Minster to visit though. I heard on the news that some council or other had scraped the Xmas tree and substituted a green cone as a health and safety measure. Well Doncaster has something very similar in the pedestrian precinct. I am sure it will look fine when all the lights are on. Ok they are not pirates but I was boarded today. :-) The mooring is now full up and boats are three deep and overhanging the ends of the pontoons. Too crowded for us so we - that is Quiescence and Abigail Jenna - are moving on. 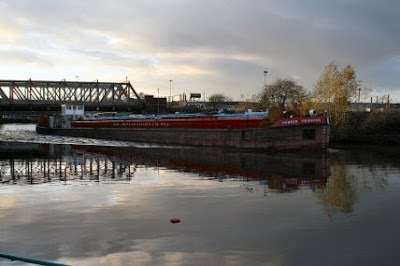 We had thought of going on to Sprotbrough but decided go in the other direction and head for Ferrybridge which is past Bramwith and along the New Junction canal and on to the Aire and Calder. Must pop across the road to Tesco before I up sticks and load up with food.